A photo opportunity with former rebels, member of the 19th Infantry Battalion and Ms. Gwyndalynn Malate, the Focal Person on Comprehensive Local Integration Program (CLIP). PALO, Leyte – Thirty former rebels were gathered for an evaluation conference at this town’s Tierra de Milagros Resort in Brgy. Arado on Wednesday, April 6. Dubbed as “Training Workshop and Evaluation Conference for Former Rebels”, the two-day event was designed to monitor and evaluate the status of former rebels from the province of Leyte who were registered under the Social Integration Program (SIP) and Comprehensive Local Integration Program (CLIP). The conference underscores the need for additional livelihood assistance and other issues and concerns of the clienteles who surfaced from the underground movement of the New People’s Army (NPA) from year 2008 onwards. During the event, the Philippine Army’s 19th Infantry Battalion based in Brgy. Aguiting, Kananga, Leyte sent two (2) Civil Military Operations (CMO) specialists to assist the former rebels in coming up with their own livelihood project proposals. The CMO Specialists also conducted consultative sessions to former rebels regarding personal security and other issues. On the other hand, Ms. Gwyndalynn Malate, Focal Person on Leyte Comprehensive Local Integration Program (CLIP) said the conference was part of the provincial government’s ongoing effort to totally reintegrate the former rebels in the community. Malate disclosed that future surrenderers will already be covered with the “Revised Guidelines for the Implementation of Comprehensive Local Integration Program (CLIP)” or the Joint Memorandum Circular 2016-02 dated March 2, 2016 which includes both the combatants and members of the NPA’s Militia ng Bayan (MB) as beneficiaries. With the same Joint Memorandum Circular, the provincial government will be giving away P10,000 basic assistance and another P25,000 for the firearms remuneration to the surrender. On the other hand, the national government allocates P15,000 immediate assistance, P50,000 livelihood financial assistance and another P50,000 if an NPA rebel surrenders with high powered firearm. 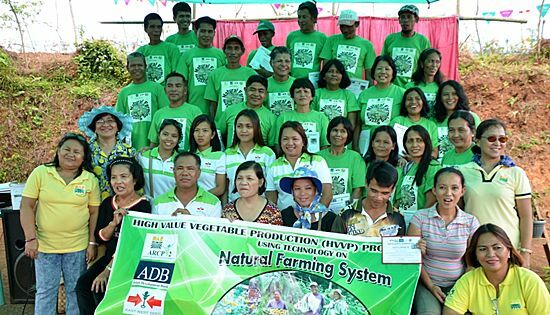 INOPACAN, Leyte – Twenty-two farmers from two highland barangays of this town are now certified organic vegetable producers after completing the five months training on High Value Vegetable Production Using Technology on Natural Farming System last month. Regional Director Sheila Enciso of the Department of Agrarian Reform (DAR) disclosed that her office tapped the East-West Seed Company for the conduct of the said training under the Agricultural Enterprise Development component of the second phase of the Agrarian Reform Community Project (ARCP-II). Participants of the said training were members of the Hinabay Upland Farmers Association (HUFA) and the Cabulisan Multi-Purpose Upland Farmers Association (CAMUFA), who all expressed happiness for having been trained on organic vegetable production. According to Edelito Merano Sr., 51, though organic farming is more tedious than the traditional way of growing vegetables which uses hazardous chemicals, the former is environment-friendly and the products are good for our health. In organic farming, Merano added, they also can save more for they no longer use pesticides and expensive fertilizers. The farmers instead used the vermicast produced by the CAMAFU sold at P350 per sack of 50 kilos only. Merchant Cristeta Abenoja disclosed that there are more buyers of organic vegetables than those grown the traditional way. Her vegetables from barangays Hinabay and Cabulisan are easily sold out for consumers already know that products from these villages are grown organically, said Abenoja. Various organic vegetables abounded during the farmers’ graduation for it coincided with the harvest festival. 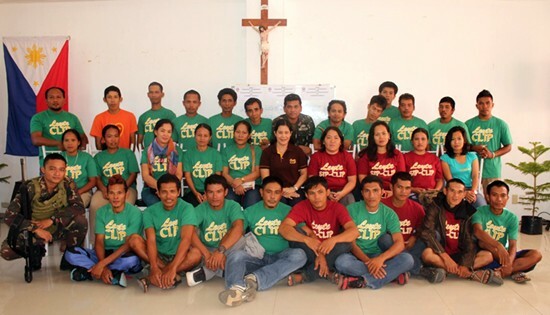 Meanwhile, 47 other farmers, 27 from the town of Tolosa, Leyte and 20 from Pinabacdao, Samar likewise completed the same training last month though on separate occasions and venue, Enciso added. MANILA – Church groups, concerned citizens, social movements, and civil society organizations are about to launch Piglas Batangas! Piglas Pilipinas!, a national campaign initiative against coal and other dirty and harmful energy. The highlight of this initiative will be a 10,000-strong mobilization on May 4 in the Batangas Provincial Sports Complex to stop the building of a 600-megawatt coal plant in Batangas City and to call for a moratorium on all new coal-fired power plants in the entire country. “It is immoral to burden future generations with pollution and the cost of mistaken energy choices made today. It is time to end the age of coal,” said Lipa’s Roman Catholic archbishop Ramon Arguelles. Lipa’s Archdiocesan Ministry on Environment (AMEn) is leading the strong and broad local opposition to coal, which has led to a delay in the construction of a third coal plant in the province. The proposed 600-megawatt plant in Brgy. Pinamucan Ibaba, Batangas City is a project of the Gokongwei-owned JG Summit Holdings. Piglas Batangas! Piglas Pilipinas! will kick off “Break Free from Fossil Fuels 2016”, a globally coordinated effort to escalate the fight against fossil fuels and to accelerate the just transition to 100% renewable energy. Mass actions are scheduled until May 15 in other countries such as Indonesia, Nigeria, Brazil, the United States, Germany, and Australia. “Almost 200 countries agreed last December in Paris to limit global warming, but the Philippines and many others are still putting up new coal, gas, oil and other fossil fuel projects. Through Break Free, the global climate movement will be demanding our world leaders to practice what they preach,” said Lidy Nacpil, coordinator of the Asian Peoples Movement on Debt and Development, board member of 350.org, and global steering committee member of Break Free. Other coal-affected communities and anti-coal campaigners mostly from Southern Luzon and Metro Manila will join the May 4 mobilization at the Batangas Provincial Sports Complex. “Piglas symbolizes nationwide opposition to coal mining and coal energy, as well as other forms of dirty energy. It is appalling that there are 17 existing coal plants in the country and 29 more still in the pipeline, particularly in Quezon and Davao,” explained Ian Rivera, national coordinator of the Philippine Movement for Climate Justice. “The mobilization in Batangas also comes just a few days before the May 2016 elections. The future President of the Philippines should heed the call of the times and usher in a new era of the free from coal and other dirty forms of energy,” added Reuben Muni, climate and energy campaigner for Greenpeace Southeast Asia. “We challenge the government to hasten the shift to renewable energy to prove its commitment to address climate change on its own. Why is it that more than 60% of energy projects in the pipeline are coal plants when we have abundant solar and wind resources?” asked Ruel Cabile, national coordinator of Aksyon Klima Pilipinas, referring to recent figures released by the Department of Energy. The leaders of the Piglas campaign spoke of six demands of the national campaign, namely: (1) Cancel all plans, permits and construction stage for coal-fired power plants in Batangas and the rest of the country; (2) implement a program for a swift phase out of the 19 existing coal-fired power plants nationwide; (3) close down all coal mines beginning with Semirara and cancel all plans and permits for new coal mines; (4) mobilize domestic and international climate finance and implement a comprehensive program for a quick transition to clean and renewable energy; (5) ensure a just transition to clean and renewable energy; and (6) implement a community-managed rehabilitation program for all local communities and ecosystems affected by coal plants and coal mines. PASAY CITY – Sen. Francis “Chiz” Escudero said the report on the “Panama Papers’ tackling leaked documents on the vast amount of wealth stashed by politicians and famous personalities, including officials from the Philippines, using offshore companies underpins the lifting of the country’s bank secrecy law on bank deposits of public officials. “The scandal surrounding the illegally amassed deposits of public officials from around the world, including some of our own public officials, kept in secret foreign accounts is a renewed reminder that we should pass a law compelling all our state workers – from the president down to the lowest clerk – to sign a waiver on their bank deposits in favor of the Ombudsman,” Escudero said. “We’ve been repeatedly told and warned: a public office is a public trust. Every single peso of the people’s taxes should be handled with care, sincerity and honesty. Every peso paid by a taxpayer should be used to advance public good, not one’s private good,” explained the leading vice-presidential candidate based on all pre-election surveys. The so-called Panama Papers details transactions by a Panamanian legal company showing an insider’s view of the massive offshore wealth of prominent politicians and public figures in different parts of the world. Iceland’s Prime Minister Sigmundur David Gunnlaugsson resigned on April 5, becoming the first casualty of the Panama Papers, so named because the documents came from a Panamanian law firm. The documents detailed paper trail and transactions of extremely rich individuals taking advantage of offshore companies to hide their wealth. The Panama Papers gave proofs that premier’s wife owned an offshore company with big claims on Iceland’s banks, an undeclared conflict of interest for Gunnlaugsson. This revelation forced many citizens to call for his resignation. Since 2010, Escudero has been submitting a written waiver on secrecy of his bank deposits attached to the Statement of Assets, Liabilities and Net Worth (SALN) he files annually with the Office of the Ombudsman. The independent vice-presidential bet filed in 2013 his proposal to compel people in government, except those who serve in honorary capacity, to submit a written permission or waiver in favor of the Ombudsman to look into all deposits of whatever nature in banks within and outside the country. He first filed the measure in 2007 when he was first elected senator. Recently, he called on all candidates to sign a waiver to assure the electorate that they won’t enrich themselves once elected into office. Republic Act No. 1405, or the Bank Secrecy Act of 1955, strictly prohibits disclosure of or inquiry into deposits with any banking institution. It also provides penalties of imprisonment or fine for offenders. “If a Filipino politician is named in the Panama Papers, he or she should be held accountable if he or she committed any wrongdoing. Filipinos named in the Panama Papers must explain why they opted to hide behind the veneer of questionable offshore companies,” Escudero said. The Panama Papers is a collection of more than 11.5 million documents, whose leak from the Panamanian law firm Mossack Fonseca fueled outrage globally after it was revealed how a group of rich and powerful people are able to keep away from the public their wealth to avoid taxes amid the sufferings in their own countries. The documents were reportedly obtained from an anonymous source by the German newspaper Süddeutsche Zeitung, which eventually shared them with the CIJ. The ICIJ then shared them with a large network of international partners, including the Guardian and the BBC. MANILA – Aconex Limited (ASX: ACX), provider of a leading cloud and mobile collaboration platform for the global construction industry, today announced that Bloomberry Resorts Corporation is using Aconex solutions to support the design and construction of the Solaire Resort and Casino in Manila. Opened in 2013, with a second phase completed in 2014, the owner-managed design-build project continues to run on the Aconex platform for Solaire's ongoing alterations and additions. The US$1.2-billion, 8.3-hectare complex was the first integrated destination resort in Manila's Entertainment City. It includes a five-star, 800-guest room hotel, an 18,500-square meter casino, 15 restaurants, a luxury shopping center, and a state-of-the-art theater. "Projects are getting faster and faster, and time is money," said Paul Soanes, a project director for Solaire. "Aconex has allowed us, as a whole, to move the project much more quickly. For example, there is no need to print and ship drawings and other information, which can easily add weeks or months to a project. On such a large-scale and complex development, with team members located in different geographies, Aconex has been essential in helping us speed up processes and information flow across the entire project." With a project team consisting of more than 540 users from over 160 different organizations – dispersed throughout the U.S., Hong Kong, Singapore, Australia, and China – the Solaire project requires strong and reliable document control and structured communications between all participants. The Aconex platform provides immediate access to project data and correspondence on a secure, neutral platform, regardless of where team members are located. The platform uses a document register with version control to manage current and prior revisions of all documents, ensuring that participants are working with up-to-date project information at all times. "Aconex makes it easy to share information and find information in minutes, regardless of file size," said Mr. Soanes. "Fast access, visibility and control are critical in keeping global project teams across multiple organizations on the same page throughout the project. Successful delivery depends on effective collaboration." According to Mr. Soanes, Aconex has improved efficiencies for different phases of the project lifecycle, including tendering and field inspections. The Solaire project team employs the platform's tendering module for procurement of prefabricated furniture, fixtures and equipment such as panels, cupboards and wardrobes from manufacturers in China and Australia. Online access to and distribution of tendering data, including RFI management, have accelerated the procurement process while ensuring accuracy and fairness. On-site inspections and associated quality and safety issues are managed using Aconex Field on tablets. With automated checklists, inspectors are able to capture, distribute and track defects and other issues in real time. The issues are assigned to the appropriate subcontractors for resolution, with hard deadlines. All communications and actions are recorded for attachment to the completion certificate and close-out prior to handover. "Solaire has already become a prime destination in the rapidly expanding Manila gaming market, which offers the best of both Las Vegas and Macau," said Andy Lake, general manager of Asia at Aconex. "We appreciate the opportunity to support Bloomberry's success in Entertainment City as they operate and continue to develop Solaire. With our growing portfolio of hotel-casino projects, we look forward to serving additional gaming and entertainment developments in the Philippines and throughout Asia." PASAY CITY – Defending human rights victims of martial law is beyond lip service said Sen. Francis “Chiz” Escudero, principal author and sponsor of the law compensating victims of martial law under the late dictator Ferdinand Marcos. In an interview in ABS-CBN’s Bandila news program last April 4, Escudero said his track record speaks for itself when it comes to giving justice to victims of the dark days of oppression during the Marcos regime. “Ako ang pangunahing author at sponsor ng batas na nagsasabing dapat magbayad ng kompensasyon sa human rights victims. Hindi naman lahat nadadaaan lang sa salita,” explained Escudero, son of the late Salvador Escudero III who served as minister of agriculture during the Marcos administration and under the Ramos presidency. “Kapag may nagawa ka na, siguro dapat yung nagawa mo should speak for itself,” he stressed. The compensation bill was passed by the Senate Committee on Justice under Escudero’s chairmanship in 2013. “Bakit ipinasa ko yung batas na nagpapabayad ng kompensasyon sa human rights victims? Twenty-five years pending sa Kongreso ‘yun. Noong naging chairman ako ng Committee on Justice, doon lamang naipasa yun, miyembro na ng Senado si Senator Marcos,” Escudero said when asked about his supposed silence on the issue of human rights violations committed during the Marcos dictatorship. President Aquino signed the Human Rights Victims Reparation and Recognition Act of 2013 during the 27th anniversary of the uprising that toppled the Marcos dictatorship in 1986. Under the law, the amount of compensation to be awarded to the victims is proportionate to the gravity of the offense inflicted on them through a point system that is a basic component of the law. Victims who died or who disappeared are given 10 points, while those tortured and, or sexually abused gets from six to nine points, for instance. On the other hand, political detainees get from three to five points while those who can prove that their rights were violated under the Act are awarded from one to two points. During the Bandila interview, Escudero also said that Sen. Ferdinand Marcos Jr. should apologize for the human rights abuses during his father’s regime. Escudero also supported calls for the Marcoses to return their alleged ill-gotten wealth to the state. 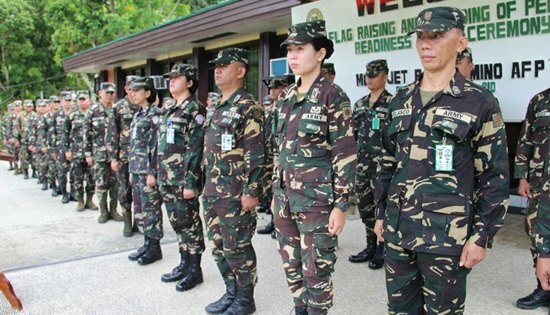 CAMP VICENTE LUKBAN, Catbalogan City – Major General Jet B. Velarmino AFP, Commander 8th Infantry (Stormtroopers) Division recognizes the achievement of eligible personnel in pinning the Personnel Readiness Badge during the Flag Raising Ceremony, Monday. MGen. Velarmino assisted by Col. Cesar M. Idio GSC (INF) PA, Assistant Division Commander and Lt Col. Leonardo C Dacumos, Assistant Chief of Staff for Personnel, G1 administered the pinning of Personnel Readiness Badge to all deserving personnel of the Command: Gold Category - 1st Lieutenant Christine Z Aguedan (NC) PA; Silver Category - Major Cherry M Llave (NC) PA, Capt. Ian Andres R Fabellon (INF) PA, 2nd Lieutenant Edibeth Veena Jane C Legario (AGS) PA, Master Sergeant Andres P Velasco (SC) PA, Private First Class Jay M Venezuela (Inf) PA; Bronze Category - Master Sergeant Rodolfo L Alingasa (Inf) PA, Sergeant John Michael L Onepig (Inf) PA, Sgt Joey B Yap (Inf) PA, Sergeant Rosalito P Yopo (MI) PA, Corporal Alex M Lutao (Inf) PA, Corporal Marlo R Revez (Inf) PA and Private First Class Roy N Herbolingo (Inf) PA. According to MGen. Jet B. Velarmino, the Command gives premium to its deserving personnel by recognizing their sacrifices while performing their mandated task as a protector of the people and the state, the numerous accomplishments is the reflection of our core values and professionalism as a Filipino soldier.